Last day - more workshops, final sketchcrawl and... see you next year in Amsterdam! 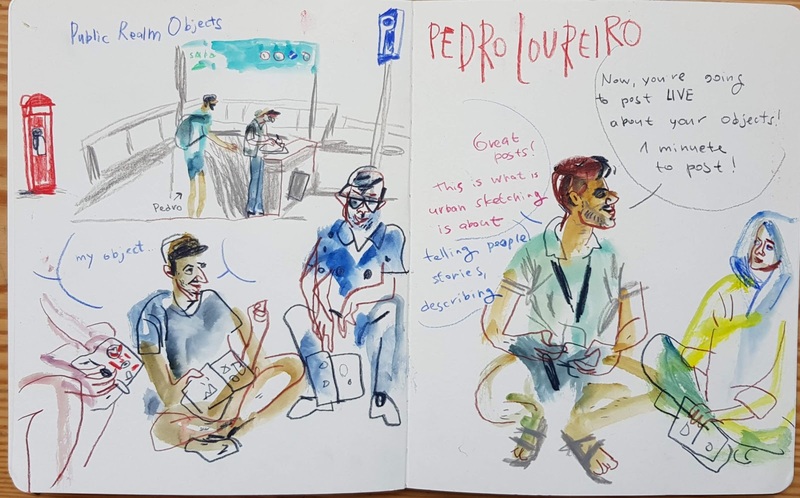 [By Marina Grechanik, Symposium Correspondent, in Porto] It is always like that - I'm waiting for this annual sketching celebration all the year and... three days fly in a moment! It's so intensive and full of emotions and experiences, that digesting all these can take until the next time. Luckily, I'm left with my sketchbook, and it will witness that all this really happened. 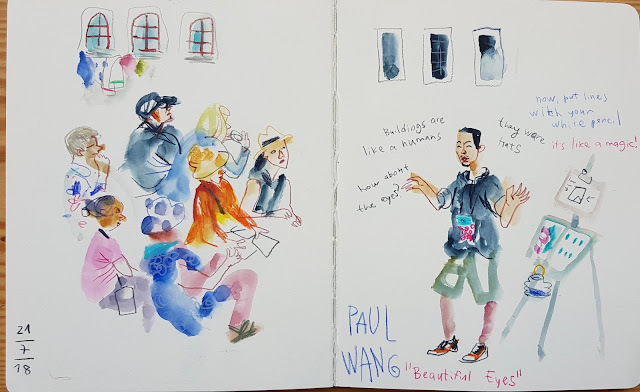 So, the first of the last three workshops that I visited was Paul Wang's "Beautiful eyes". Paul took his group "window shopping" ;) I liked him comparing buildings to people, and their windows to eyes. 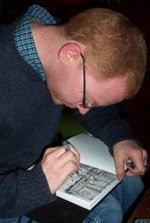 Paul explained step by step different techniques of sketching windows. Looks like his group enjoyed a lot! After meditating with Paul's group by sketching beautiful Porto's windows, I passed to the workshop of Pedro Loureiro "The Stories of Realm Objects". 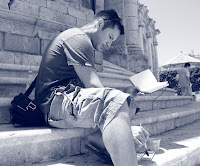 Pedro forced the participants to pay attention to usually unnoticed objects - public realm objects, to study them and to make a visual reportage about chosen object, each one in his own approach. I arrived just before presenting the "reportages" and it was really fun to see how many stories sketchers found behind the objects we usually don't pay attention to. 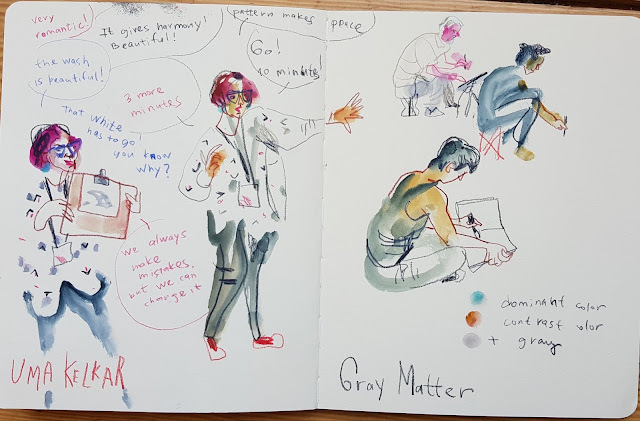 The last workshop was Uma Kelkar's "Gray Matter". Uma broke in a very clever and simple way so complicated process of painting with watercolor. She suggested to use only two contrast colors and grays, to create wonderful watercolors of the view. I saw really great results all the group did! 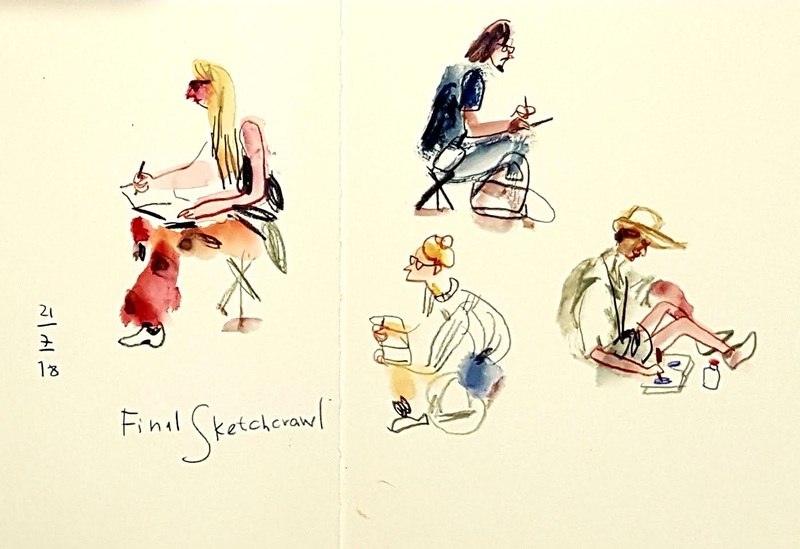 After the lunch sketchers headed to the Praça da Liberdade for the final skerchcrwal. It was fascinating to see the square filled by sketchers! 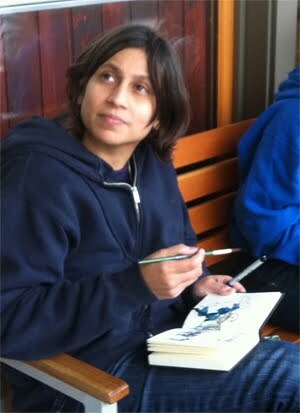 I started by doing sketching duel with Nelson, who had a birthday, and at the end he got his present - my sketch! Here are some more sketches I captured during the sketchcrawl. At the end 800 sketches had gathered for the traditional group picture - the biggest reunion ever! 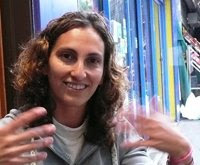 my fellows correspondents Rita and Paulo. Our sketches mixed on the paper and I think our energies and passions created sort off 1+1+1 is much more than 3! I didn't pay attention how time passed! 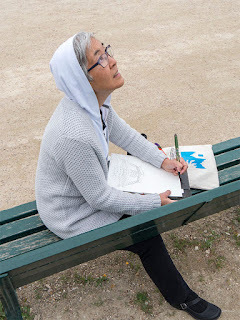 Being correspondent was for me really fabulous experience, I tried to transfer as much as I could from what I saw - having in mind especially those sketchers who couldn't join the party. See you next year in the Amsterdam!